There were a whole lot of things I liked about this book; its argument is expertly put together, its incredibly well-field researched and its backed by unique province and even county-level datasets. Its clearly been his life for a number of tough years. Here are some of the things I learned. Koss shows that the Party is still strongest, even today, in the areas which Japan occupied in the 1930-40s. It was there, during 1937-45, that the combination of shelter from KMT attacks and invigorated nationalism helped win converts to the communist cause. Those are today’s Red heartlands - the major northern cities (& Shanghai), Liaoning, Shandong & the Hu and He twins have the largest number of Party members, then and now. Down in the south, ‘Pink China’, the Party is weaker, and probably always will be. Its a remarkable finding - that historical legacy is so powerful, explaining some 60% of membership variation today. Here is Koss’ map. Worth a minute or two of reflection. Party membership matters in practical ways which foster regime survival. Koss has data to show that One Child policy-enforcement and tax collection have worked better in Red areas. The explanation he spins here is enticing, a variation on the thumb and fingers approach (authoritarian governments usually have the first, but not the second, making them vulnerable, especially in an economic crisis). He posits that while government officials get on with routine tasks and collect data, Party members are tasked with priorities and soak up ‘soft’ information. Given they occupy different social groups, the Party thus has eyes and ears all over. So when there’s a demonstration, bureaucrats collect names and numbers, but CCP members are asked to give their opinions on what happened, and presumably the motives of those involved too. This allows the response to be fine-tuned. In theory, Party cells meet weekly. Thumbs and fingers, hard and soft data - makes for smarter governance. Koss is also really good on the mechanics of Party membership. I’ve never thought of applying, but it sounds like a real hassle - months of a couple of Party member sponsors ‘mentoring’ you, weekend courses at your local Party School, tons of mindless homework and memorization, and if you’re lucky, a viva, which Koss describes as more like a Varsity hazing, plus a swearing to the flag. You often hear that people don’t join up because they believe in Communism, that its just a career-ladder thing - as though that was a sign of CCP weakness. Well, durr! That’s not the point - the Party is consciously selecting loyalists, not believers. Check out the recent video of Qinghua University students, presumably from the Party cell, singing “Me and my Motherland will not be divided for a single moment”. Marx would have been appalled. By limiting recruitment - Koss reports that since 2014 the Organization Department has cut the new membership quota - that goal is achieved. He has an excellent chapter on the Cultural Revolution (CR) too, explaining how the Party maintained a semi-functioning administration in the midst of de facto civil war in many regions. ‘Production Headquarters’ (生产指挥部) got some independence for running the economy, while the Party seniors made sure that they controlled local Revolutionary Committees (革命委员会). Koss does not rate the role of the People’s Liberation Army (PLA) in re-establishing order, which is interesting. For many scholars the PLA was critical (see for instance, MacFarquhar and Schoenhals’ Mao’s Last Revolution. 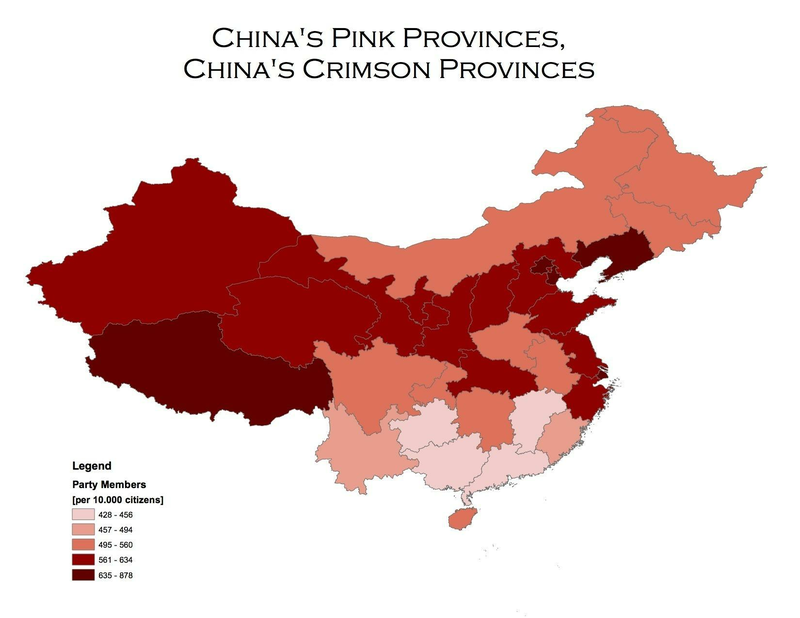 ‘Pink’ areas saw more CR violence as a result; Guangxi, for instance, is infamous for its mass killings. Finally, I came away with a fuller appreciation of the role of the war in building CCP strength. The Anti-Japanese struggle really was the furnace in which the Party was wrought. But not the fighting, but the quiet resistance struggle. Koss shows Party membership was/is low in areas un-occupied, high in contested regions, and low again in areas where Japanese rule was basically uncontested. But while the half-life of that war is long-lasting, its not eternal, so since 1992 we’ve had the Patriotic Education campaign at school and on TV night after night. Much of the CCP’s current paranoia about ‘fake historicism’ (虚伪历史主义) is that accurate history reveals how useless Mao and his peasant army were in the actual fighting, however well they did to take out the KMT after the Japanese had skedaddled. As Koss notes, there’s a solid literature about how revolutionary parties born out of war are stronger. But that also means that the war-footing can never be downgraded if Party strength is to be maintained. So the logic of Party rule is that there must always be enemies to defeat - and wars that need to be fought tomorrow. This is the logic that creates the international danger we face today. Back to Koss and a few questions this great book left me with. In the Mao era, Koss shows that cadres in “Red” counties tried to resist Great Leap Forward (GLF) policies - and were moderately successful in that; they had lower mortality rates as a result. This is a little counter-intuitive for his thesis that Party members help enforce central policy, but he argues that these officials were acting in the long-term interest of the regime. Hmmm… fair enough. But its also signaling that Party members are either more willing to, or more able to, resist Beijing when they think the Centre has gone bonkers. Backing that, there’s also a cool (but disputed) APSR paper by James Kung and Shuo Chen that argues that alternate Politburo members over-enforced GLF grain quotas in their provinces. They were happy to sacrifice lives if that meant they could strongly signal loyalty to Mao and win a promotion. So I wonder, how bad does policy out of Beijing have to be before local Party cadres start disobeying it in the interest of regime survival? There will be testing times ahead if the economy continues to grind slower, which I guess will be the story of 2019-20. Steven Solnick’s Stealing the State made a big impression on me when I read it years back. He describes how Soviet bureaucrats “defected” as the economy died and incentives for obedience to Moscow disappeared. Without them, with no one in the field to do the real work, the regime could only silently disintegrate. There was much whimpering before the 1989 bang. Solnick gets into the carrots and sticks that motivated folk in a way that Koss does not. It comes down to money (the Party can help your career) and social status (your Party card means you’re respected/feared just a little bit more). But when things go south, both incentives stop working. Which is why Beijing fears an economic downturn We are a long way from mass defection in China - but today’s grumbling will get worse. So the question of how Red and Pink areas will react in a recession is an interesting one; where should we expect more resistance to Beijing from? Second, Koss does a persuasive job explaining how Party and government employees twin-team problems, all those thumbs and fingers. But how does the Party deal with all the information up-flow from its millions of branches? There’s always requests for reports from up above, survey teams being sent out, but how on earth does all that information get sorted, discounted, put together, comprehended, and acted on. I don’t recall reading any good work on that (especially on the Party, rather than government, side). Its quite some amazing black box. There must be a pretty well-crafted devolution of decision-making and veto powers down to local government, so that only the most important issues get pushed up to Beijing. But at the same time, there are a thousand and one ways that local folk lie-up. I remember having dinner with some Xinhua journalists a few years ago. They complained that their colleagues who do the internal reference reporting for leaders often got bought off by local officials, coloring their supposedly independent on-the-ground reporting. So, while the CCP undoubtedly has loads of information, how on earth does the Party manage it all? Finally, Xi Jinping. The Party is his now. He’s done well to come out on top, and is lucky to inherit a Party so finely-tuned for rule. But he’s clearly not a chap to rest on his laurels, extending and empowering the Party: He’s attempted to rebuild the Party’s credibility and its overall efficacy via the Anti-Corruption campaign. He’s partly side-lined the government bureaucracy, and absorbed powers into the Party. Given its moved from government to part, economic policy is now much more campaign-style. He’s extended the Party into ‘new’ areas, including corporations. He’s turned up the Study Meetings, reviving ideology as a loyalty-demanding force, and recently led the Politburo in a self-criticism session. (Much of this revised ideology is nationalism, as I described here. He has determined, apparently, that this Party was not stable or influential enough. He seems to have reversed course on some of the Party priorities of the Jiang/Hu eras. Back then, Party building focused on the new urban areas, on bringing business into the Party (the so-called Three Represents). Xi is more interested in the old base areas (cue his love for Liangjiahe), and old people (cue all the demolition of fun and convenience in Beijng because the old residents did not like how “crowded” the city had got). Xi is the man for the places and people the Party forgot. Cue Wang Jianlin’s recent announcement he’s building a big CCP theme park in Yan-an. Talk about signaling loyalty. Now, whether this strategy ends up bolstering the Party’s ability to govern or not, I think the jury is out. The costs are obvious. All that ‘Red Tourism’ costs money; Party Committees in firms will reduce productivity. Talented Party members will no doubt be bored by all the study and exhausted by all the instructions flooding in from Party HQ, and (with fewer pecuniary upsides these days) many will decide the costs of sticking around are too high. Any long-lasting downturn would exacerbate all that. But that said, the CCP (not the state) has the monopoly on legal violence, and as Mao and Deng both showed, that’s ultimately what keeps the Party in power. Fingers are great, but thumbs are sometimes effective too.